So in my previous post I said life was about creating the person you were meant to be... Reading over my that blog, I had the giggles as I found myself a bit hypocritical. Hypocritical not in an insincere way but more so as -if I have the insight on what to do why haven't I mastered the full ME yet? I always loved to read. Loved it to the point I knew if I wasn't going to become a forensic psychiatric I was going to be a novelist (since my early teens I always held journals).Well between not being the best scholar, loving to dance and partying; reality had to sink in and by my early twenties psychiatry was no longer part of my future. Ha! However, reading stayed a constant interest. 1992 when I came to the US, I had to discover and build a new catalog of English writers/books to keep me going. Naturally I was geared toward African American writers and the history of the culture. I loved the way ( in most fiction or non fiction books), the writers background were clearly the essence of the book. Loved how easily you could relate because their stories could easily be your story. They didn't have to use much imagination or make believe. Their surroundings, their experiences, their lives, the neighbors' lives were the book. So in the process I was introduced to Toni Morrison, Alex Haley, Maya Angelou...to name a few among the greatest! In my eyes, Dr. Maya Angelou was/is the epitome of a writer. When I started reading her work, my dreams got even bigger. I started thinking maybe I could be a "Maya Angelou" ...one day!!!! Ha! Fast forward to 07/2004, one of the greatest moment in my life happened. I was a coordinator in Food and Beverages at the Four Seasons Hotel. A morning call came thru and I looked at the call' screen and it read "Dr. Maya Angelou"! I remember my heart skipping a beat. I was so nervous but I also knew as part of my job I couldn't let out or show any excitement. I picked up the call, inquired of her needs in the most professional manner and to my surprise (or not really as I could only imagine her as a gracious, courteous and caring person) she started to ask me questions about little ol' me, where I was from, my life... In the 5 minute conversation we had, I managed to let her know how much I loved her books and she thanked me!!!! I mean I'm the one who needed to thank her! 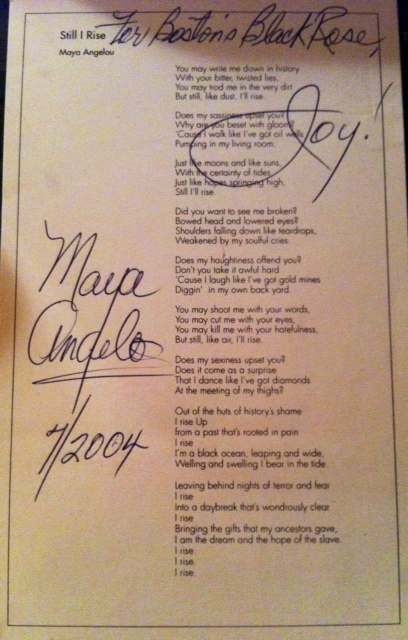 In any case, later on that day, she had this signed copy of the well know "Still I Rise" poem delivered to me. It is one of my dearest possession and one of my biggest motivation. They say " don't reveal your New Year resolutions until they come true. Well I guess I can share this one. No one and I mean NO ONE could tell me that this wasn't a sign! 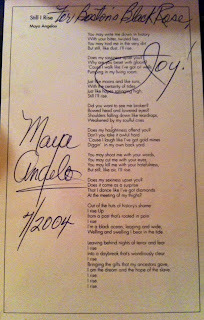 I waited impatiently for a week, everyday looking at my signed copy of Maya Angelou "Still I Rise" poem, thinking if I could only have an ounce of her talent, soon my dream will rise high enough so one day a signed copy of my work will be framed next to hers. A month later, December 27th 2011, my friend Veronica Ronnie Marshall got her 1st book published http://www.lulu.com/product/paperback/i-know/18781972 and if this wasn't for me a testament that with commitment, hard work and faith, all is possible than I'm truly not destined to achieve my all and true potential. Her story, the legacy she wants to leave her children were part of her driving force and motivation. She was the additional sign I needed as she is the only person I know whom as achieved what I so far only dreamed of doing. I'm going to close the circle by saying, look around you when remembering an old goal or ambition, don't label it as a dream because it is the universe way of reminding you of what you've forgotten. Aspirations that have not come to, are a constant fire in the back of your mind, they wont disappear unless addressed. Be in tune with yourself and you'll see the signs that will help you create the you you were meant to be. Thank you to Maya Angelou for writing about rising yourself up regardless of any obstacles/hurdles along your way. Thank you to my family and friends who take time to read me and push me to do better. Rosie, you are inspiration enough but this just floors me. This blog is the reason I will strive to be a better person each day, month and year. Your words are flawless, your ideas sparkle and I cannot wait to buy my first RosieSanz book. Congratulations!